Boost your productivity with reliable access anywhere with services like email, calendar, file sharing, online conferencing, instant messaging, and Office Online. Whether you’re working in your office or on the go, you get a familiar, top-of-the-line set of productivity tools. We have the expertise, tools and experience to quickly move your email and documents to the cloud. Get started with Office 365 then easily add other Microsoft Dynamics 365 apps. 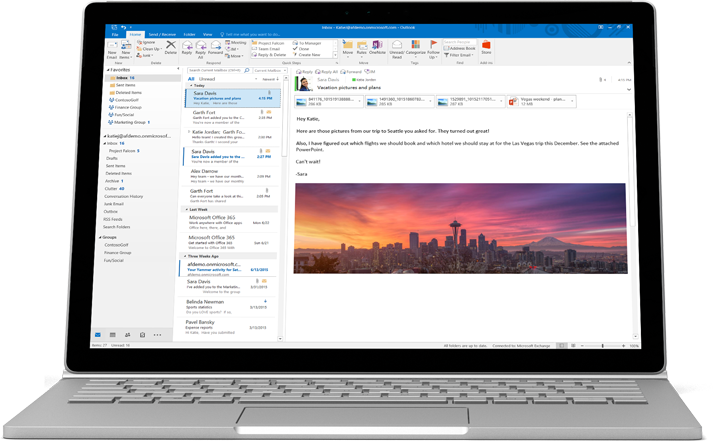 Office 365 syncs emails, calendars, and contact information across your devices in real time: so, it’s up to date, no matter what device is in your hand. Shared calendars let you see when people are free or busy at any time. Scheduling is easy and hassle-free from anywhere. You'll have industry-leading anti-malware protection and anti-spam filtering to guard your email from those ever-present mail threats. It’s easy to meet and connect online from wherever you are on whatever device works best. This means travel time and costs are reduced, so that you can get more done and keep your projects on budget. Having your files stored online makes it easy to store, organize, and share them, so you can work on documents with teammates, share reports with business partners, or connect with customers. Your files are always up to date, so that everyone you have chosen to collaborate and share with has access to the latest version. Keep everyone up to date and working together as a team. Microsoft Planner, OneDriveand other applications help keep your tasks, files and plans accessible and in sync.